Rainwater is soft and free of bacteria and mineral contaminants, and what&apos;s more it is free. However we let it soak into the ground and become contaminated and the attempt to filter it so we can use it. Here we look at collecting rainwater, how much we can collect, how we store it, if we need to filter it and what we need for a rainwater harvesting system. 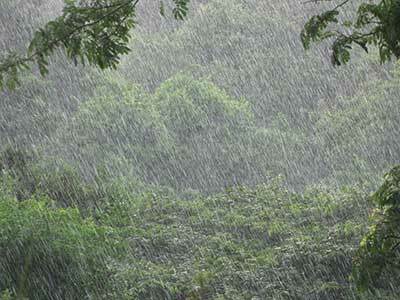 We also look at the considerable advantages of rainwater harvesting. Make no mistake Bali is facing a water crisis that is getting more serious every day. As more buildings are competed, more bore wells are being drilled sucking water out of a water table that simply cannot cope and the advance of seawater into the water table, already many kilometres inland, continues apace. We should think about our water. Let&apos;s face it we are 90% water so, after the oxygen we breath, water is probably the most important thing keeping us alive. In spite of this there are some who believe that everyone should have to pay for their water. The purest water we can get is distilled water, water that has been boiled to evaporate it then cooled to condense it back into water again. Large amounts of soft, beautiful, pure water falls from the heavens onto the earth around us. As it lands it absorbs all the dead rats, fertiliser, mosquito chemicals and dog poo we have lying around, it then seeps into the ground where it picks up a few nasty bacteria from septic tank leakages and the neighbour&apos;s pig sty. As it travels lower it absorbs a few heavy metals: lead, cadmium, mercury and the like followed by calcium and manganese which makes it hard before entering the water table proper where it may well mix with some sea water making it saline. We now drill a hole up to 50 metres deep, install a pump and, at great expense, pump this toxic brew up to the surface where, at even more expense to say nothing of inconvenience, we pump it through god knows how many filters, softeners and conditioners to make some feeble attempt at removing all the noxious contaminants it has collected on its adventure through the earth. High pressure pumps drive it through filtration systems, using electricity and an endless supply of filter cartridges and membranes which may need changing on a monthly basis. The hard water leaves "scale" everywhere blocking our water heaters, leaving fur in our kettles, drip marks on our glass, thick deposits in our washbasins, toilets and the tiled walls and floors of our bathrooms and leaves our clothes and bedsheets grey and as crusty as a fresh baguette. Now that&apos;s a really sensible way of doing things isn&apos;t it? Might it not be a good idea if we collect the water as it falls from the sky and store it in its pure, unadulterated form ready for use at a later date? We are, of course, talking about rainwater harvesting. But is it possible? Is it viable? Some gutters on our buildings to collect the water. Tanks to store it in. A little engineering magic to allow the rain to wash the roof off before we start collecting water. Enough roof area to collect the amount of water we need. Some basic filtering to stop leaves and the like getting into the tank. To keep the water in the dark so that algae doesn&apos;t grow in it. A small pump to supply the water to our taps. Other than that it is all fairly straightforward really. How Much water can we collect and how much will we need? How much water can we collect? How much water do we need to store? If we are careful with our use of water an average couple can expect to use around 170 litres of water per day or 62,000 litres per year. See the water usage calculator at https://www.mrfixitbali.com/water/water-usage-bills-and-charges/water-usage-calculator.html. Denpasar averages around 1,650 mms of rain a year which gives us 1,650 litres per square meter of roof area. That&apos;s 98,000 litres per year from a 60 square meter roof. Obviously rainfall varies considerably and generally speaking it will be wetter on higher ground but dry as a witches mammary gland on the bukit. Finally we will need enough storage to get us through the dry season and, rather like the cash flow in a business we need to plot our expected collection and usage of water through the year. We need to allow for a storage "buffer" to get through those exceptionally dry years. The storage system needs to be carefully designed to protect our precious water from contamination. With some clever thinking, such as recycling grey water to water the garden, we can minimise our water usage. We now do a bit of investigation of how much rainfall we can expect over the year and obviously this will vary from year to year. Here is our Rainfall Harvesting calculation for Denpasar, based on a single couple using 220 litres per day with a roof area of 60 square metres. Calculations are based on a couple using 220 litres of water per day. 1 mm of rainfall yields 1 litre of rainfall per square metre of roof area or 60 litres for a 60 square metre roof. 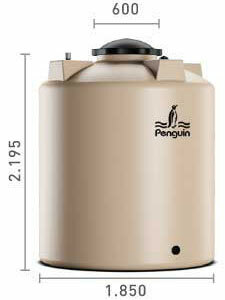 Water used for our sample couple per month is 220 litres X no days in the month. The balance of water at the end of the months is the amount of water in the tanks at the start of the month plus the water collected in the month less the water used by the end of the month. To collect rainwater we will need well installed roof gutters around our roofs. These should be 8 inch wide box gutters with strong mounting brackets a maximum of 60 cms aparts. There also need to be adequate down pipes, 4ich diameter minimum and preferably 6 inch diameter. It is important that you never underestimate either the weight of water (a full gutter can be very heavy) or the amount that will be flowing off even a reasonably sized roof. Steps should be taken to prevent leaves or other contaminants entering the water collection system. It is best to have no trees overhanging roofs used to collect rainwater. A system should be installed that allows the first water that runs off the roof to bypass the collection system, this will have the effect of flushing the roof clean and removing bird droppings, dust or ash before water collection begins. It is a good idea to install a water meter so that you can regularly check to see how much water is being used from the tanks each day. The meter should be placed immediately after the water supply pump to the house from the storage tanks(s). Your water supply will depend on receiving sufficient rain and using it wisely. Isntall a rain gauge so you can monitor the rainfall. This will give you a warning if rainfall is lower than expected and it will also allow you to calculate how much rainwater you should be collecting which, when compared with how much you are using (from the water meter) you can keep your eye on whther you are losing any. There are two main choices for water storage, an underground renforced concrete tank and large pastic tanks. The plastic tanks will last forever as long as they are kept away from sunlight. They are probably cheaper and can be bought in a range of sizes. I would favour several 5,000 tanks depending on your needs. The tank shown here is a 5,100 litre tank made from polyethylene. For our example above 50,000 litres of storage is probably advisable to get through a particularly dry year thsi would require 10 x 5,000 litre tanks at a cost of around 11 million Rupiah (around US$800) per tank for a standard free standing tank. Remember we need to keep the water in the dark to prevent algae growth. Building these tanks into a basement is probably a good idea and in such a way that the pipework can be accessible should there be a fault. There should also be enough headroom to allow acces to the tanks for cleaning should it be necessary. Note that underground plastic tanks are available but are considerably more expensive. Standard tanks should not be buried undeground because, if the ground becomes waterlogged and the tanks are not full they are likely to pop out of the ground as they will float on groundwater. These should be built underground. They will require reinforced concrete walls and floor and be able to withstand earth tremors. A manhole will be needed to gain access and onec again needs to be designed so that no light can enter. For our example above a tank 2 metres deep and 6 metres by 4 metres (the size of a garage) will give 48 cubic metres or 48,000 litres of storage. Such a tank will not necessarily need to be tiled on the inside but a good lining of good quality waterproofing paint is probably a good idea. It is also a really good idea to make sure you have some sort of water meter to monitor how much water is in the storage tanks. This will tell you how much water you have stored and how carefully you need to be in managing it. A UV filter to kill off any bacteria that might get into the system. A sand filter to collect any dirt that might enter the system. This article, or any part of it, cannot be copied or reproduced without permission from the copyright owner.